I recently starting listening to more audiobooks to give my eyes a rest after long workdays and to keep my mind active when tidying up the house or while I'm out for a run. One book that has me thinking a lot lately is Atomic Habits: Tiny Changes, Remarkable Results by James Clear. There are so many "golden nuggets" of wisdom in this book, but there is one quote that really stood out to me. We all have the best intentions, Clear explains in his book. Many of us also love to set goals for ourselves and for our businesses (I'm raising my hand!). But if we don't also set ourselves up for success by building good habits and systems, then how can we expect to reach these goals? If we were to reach them, it would certainly take much longer without good habits. He suggests taking small actions so that we can make our big goals more doable and feel like less of a chore. Marketing in a consistent way is the perfect place to start building good habits in our businesses. But it can be overwhelming. That's why, a lot of times, we end up procrastinating instead. Or we spend more time than we'd like to admit not marketing our businesses only to realize that we have made little progress, or worse, we've earned less income than a previous year. Of course, we know that if we don't market our businesses in some way and on an ongoing basis, then we run the risk of experiencing more times of famine than feast in the future. Sure, our clients might find us. Referrals and a solid web presence make that possible. But we cannot assume that relying on referrals or web traffic will give us a better result next year than they did this year. We can, however, assume that if we market our businesses effectively and consistently, then it is likely we'll have a result to show for it by the end of the year. Taking small, manageable actions every day to market our businesses, is what will get us the traction and the results we seek. I have heard Ed Gandia, a business strategist and the host of the High-Income Business Writing Podcast, say more than once that even if we have a steady stream of client work, we should be actively and consistently marketing our freelance businesses. He suggests sending several warm emails every week, doing it first thing in the morning and being more concerned about the action of actually sending the emails than the responses we get from them. Because, in the end, the more we put ourselves out there, the higher our chances are of gaining new clients and building more solid business relationships. Seems pretty logical, right? In addition to Ed's approach, I really like James Clear's suggestion of setting up a cue that triggers the action. The repeated action will, over time, form a good habit that allows you to achieve the results you want in your business. Of course, the opposite is also true. If we have cues that trigger an action that feeds a poor habit, then we will continue to get a poor result. For example, say our cue is delivering a project to a client. This cue then triggers the action of opening up a social media application because we have some time in between projects. We run the risk of forming a poor habit if we are using the social media application only to find ourselves falling down a rabbit hole of tweets, messages and shares. Instead, it would be more effective to use the time spent on the application to engage with clients and actively market our businesses. Atomic Habits also made me realize all the cues and triggers we experience on a daily basis and what it could mean if we started to consciously and intentionally shape them. For example, a cue to start sending more of the warm emails Ed suggests could be as simple as this. Every morning when you make your coffee and sit down at your desk, open your computer and your email. You don't answer a single inbound message until you've sent a warm email to a prospective client. This allows you to move on with your day and know that you've already handled a marketing task before you even have the chance to get lost in a sea of emails. Here's one of my own suggestions I'd like you to consider. Commit to spending 20 minutes a day on marketing your business to your clients. Whether that's 10 minutes of engaging on social media each morning and another 10 minutes spent crafting warm emails to potential clients (or following up with those who you've met at networking events, conferences, etc. ), the effect of this small habit will certainly add up over time. Let's say you work eight hours a day, five days a week. By committing to 20 minutes a day, that still leaves you 460 minutes every day to handle the rest of your work. How's that for some perspective? If you spent 20 minutes a day the way I just described, 5 days a week for 48 weeks out of the year, you would essentially engage with clients on social media for 2,400 valuable minutes and send 240 warm emails to prospective clients. I'd be shocked if you told me that this habit yielded few results. In addition to warm emails or engaging with clients on social media, you could use good habits with cues and triggers to sit down and write a blog post or an article to share on LinkedIn over the course of a week. The actual marketing you do depends on your audience, but you get the picture. I realize this all sounds like logical, common-sense advice, and perhaps as though we just need a little willpower to make these things work. But I do believe it's more than simple willpower. After all, if it were easy, we wouldn't have people writing books on habits and systems. Many of us choose not to market our businesses for fear of rejection. Or because we are overwhelmed at the thought of marketing. Or because we simply don't know where to start. And instead of taking action in spite of rejection, or finding ways to reduce the overwhelm, or learning ways to market our businesses effectively, we often find ourselves simply using these issues as obstacles. We make excuses. These are obstacles that we have essentially created for ourselves. We all do this in some area of our businesses. So, let's commit to changing that by rising to the level of a few newfound habits and systems to achieve the results we want to see in our businesses. If you've been reading this blog for any amount of time, you probably know that I talk about this topic a lot. And whenever I come across anyone who is resistant to the idea of providing extra value to clients beyond that of the services we already provide as translators/ interpreters, I seem to get the same response. They usually say something along the lines of, "I don't know what kind of value my clients might want." And typically, my answer is, "You know more than you think!" There are a lot of ways to offer value to your clients beyond the T&I services you already provide. And for some of us who work in language pairs that can have a somewhat saturated market, this is essential! We have to stand out. And to anyone who says, "I don't need to provide any more value than the services I already offer," to that I ask, "Then, what makes you different than any other translator/interpreter who provides the same service?" I know that seems a bit harsh. But if we don't start thinking about the value we provide, both as part of the services we provide and in addition to them, then we may very quickly feel like the market is taking over and we're floundering to raise our rates or find better clients. Everyone is selling something these days. So, it's important to be seen as different. Yes, this is one of those cases in which being different is a good thing! Of course the translations and interpretations we provide to our clients are incredibly valuable. But they are often thought of as a service that is requested, completed and billed. End of discussion. So, how do we provide even better value so that our clients consider us an integral part of their larger team? How do we keep them coming back to us time and again? Surely, a large part of being valued is due to the services we provide. But it's never just about that. After all, if it were just about the service, our clients would all be shopping around for the least expensive option, right? Who wouldn't be?! So, there has to be something more. By providing more value than other options (i.e. other translators/interpreters in your language pair(s) and area(s) of specialization), we also give our clients more reason to stick with us for the long term. By building relationships with our clients, we learn how to provide them even more value. We learn how we can serve them best. We learn what their challenges are and how we can help to relieve some of their stresses and challenges. But it doesn't happen overnight. There are plenty of ways to serve our clients in ways other than translation/interpreting that make us even more valuable in their eyes. If you are struggling to come up with some ideas, my best advice is to listen to your clients. Talk to them. Get to know them better so that you can understand the obstacles they face and the goals they have. Then, figure out how you can help them to overcome those obstacles and reach those goals. When trying to think of additional ways to provide value, first consider your strengths, both as a professional, and in general. ● Are you a great socializer/connector? Do you know a lot of people and can you connect your clients to others who could help them along in their business/goals? This is valuable. ● Are you an amazing researcher? What can you research or provide that shows even further value to your clients over another translator/interpreter who may not have this superpower? This is valuable. ● Are you a great writer? Can you write for the industry(ies) in which you provide your services so that you can both show your expertise and provide value in another related capacity? This is valuable. ● Are you a wonderful speaker? Could you start speaking at events and conferences that are related to your area(s) of expertise? Not only can you provide knowledge and value to others, but you will soon make even more connections that can open more doors for you! This is valuable. Notice that none of these suggestions above have anything to do with making a hard sell. That's really not the point here. Providing added value is what allows others to like, know and trust you. From there, people will want to do business with you! Whatever you do choose to do to provide more value, own it! Don't be shy. Tell people about it. Others will want to help you by connecting you to those they know and who could use your services or gain from the value you are sharing. 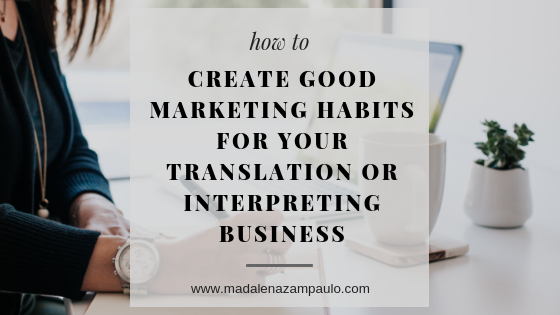 Here are some ways to spread the word about your added value that will allow you to also shine as an expert translator/interpreter. ● Write a blog post or an article for LinkedIn and send it to your clients' inboxes. Try to do this regularly and watch how much you can engage your target audience. ● Think of what challenges your clients face and try to come up with some clever solutions. Since you know the industries for which you work, something like a guide or tip sheet that could be helpful to your clients in some way is an idea that comes to mind. ● Offer some extras here and there to show that you think more deeply about your clients' projects than just shooting back a translated text. I don't suggest you work for free, but sometimes it's the small and unexpected things we do that people notice the most. The more you think about the added value you can provide to your clients, the more you will be able to keep their best interests in mind. Your clients will appreciate you even more than they already do. The possibilities here are endless. If you always try to come from a place of serving your clients, the rest will fall into place. You don't have to be salesperson of the year. You just have to think outside the box.